Follow the steps in the "How to Register" tab to the right to register for the 2019 Middle School National Tournament. -Download the required Entry Agreement Form and view instructions for how to upload it. -Download the required Media Release Form and view instructions for how to upload it. -You will pay your invoice through your NSDA account. View instructions here. Important note: Every event will use online ballots at the tournament. Please remind your judges to bring an electronic device they can use to fill out a ballot. All judges must have a Tabroom account before they can be entered as judges in the tournament. They can create an account by clicking "Sign Up" at Tabroom.com. Share these instructions with judges for how to use online ballots. We are excited to host you in Dallas for the 2019 Middle School National Tournament! 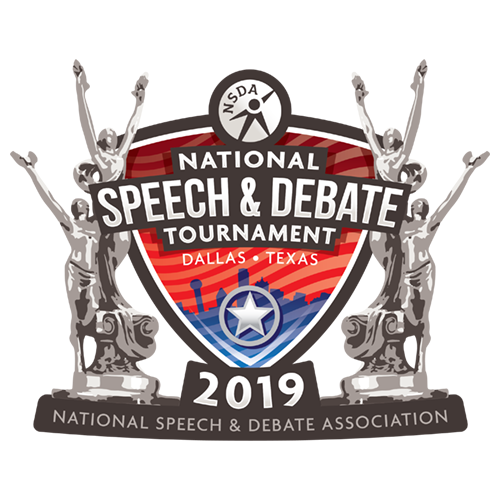 Please contact the NSDA at info@speechanddebate.org with any questions.